The `Traditional` Metal Bed by the Bed Butler Company has a very simple design but has taken inspiration from the skills perfected by the Victorians. Skilled craftsmen have created a modern metal bed that will be welcomed in any home. Even with its simplicity it still projects great charm and elegance. Reflecting more than a little influence of Victorian design and heritage it projects a nostalgic air of times gone by when you were only a child. Our skilled craftsmen, working with only the very finest materials and using time honoured manufacturing processes to produce a metal bed that will always have a pride of place in any bedroom. There are many things to take into consideration when choosing the right metal bed for your bedroom. Not only the design, size and height of the bed should be considered, but also if it will fit into the dï¿½cor of the bedroom. The advantage of the `Traditional` metal bed is that, because of its simplicity, it will match any decor. The style of the Traditional Metal Bed is enhanced by antique brass domes situated at each corner of the bedstead. This will ensure that it will never date and because of its traditional look will always remain a centre piece of any bedroom. Because of its simple look it will be ideal for decorating the bed with colourful cushions and bed linen. The beechwood sprung base will support any type of mattress. It has a very simple design but has taken inspiration from the skills perfected by the Victorians. Even with its simplicity it still projects great charm and this endearing bedstead proves the point to great effect. The style of the `Traditional` Metal Bed is enhanced by heavy antique brass domes situated at each corner of the bedstead. It Comprises of a sprung iron base with a traditional interlocking system to connect to the bed head and foot, this makes the bed very simple to erect. 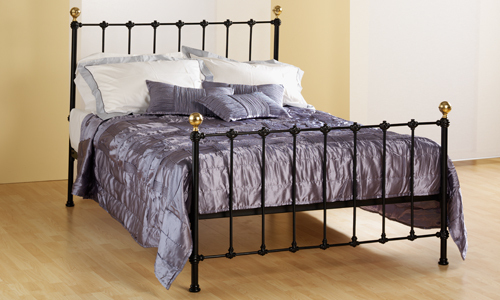 The Bed Butler `Traditional` Metal Bed is finished in black making it very easy to fit with most decors in the bedroom.